Welcome back to The Cookie Elf File! 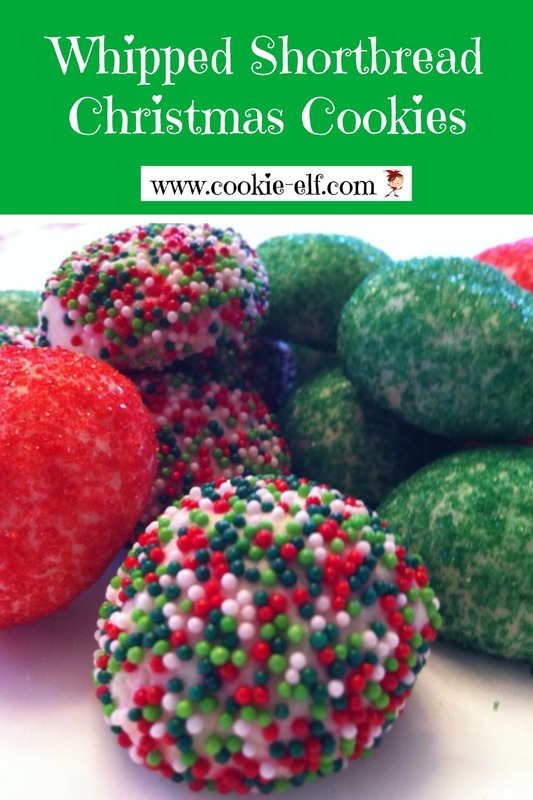 During December, look for 12 easy Christmas cookies from The Elf – recipes and simple baking tips for making them. Whipped Shortbread Christmas Cookies follow the classic ratio for shortbread’s traditional three key ingredients: one part sugar, two parts butter, and three parts white flour. The cookies have just 5 ingredients, one of which are decorative sprinkles! But rather than pressing the cookie dough into a pan, you mold it into small balls and roll it in decorations, sprinkles, or colored sugar. The rolled balls make a colorful addition – and a rich one – to a holiday cookie tray. Get the full recipe for Whipped Shortbread Christmas Cookies … and get more ideas for different kinds of molded cookies on The Elf’s Molded Cookies Pinterest Board. When it comes to making rolled cookies (like Whipped Shortbread Christmas Cookies or Christmas Sugar Cookies, avoid handling cookie dough too much before rolling it into balls or cut outs. Extra mixing and kneading allows gluten in flour to expand, giving cookies a harder, tougher texture. Cookie dough also gets too tough if you add too much flour. Cookies that have an extra-hard texture are extra-hard (and less fun) to eat. If dough is too sticky to handle, set it in the refrigerator to chill for 15-20 minutes and then roll it. See more helpful baking tips on The Elf’s Baking Tips Pinterest Board .